Security screening at LPA Gran Canaria airport is of utmost importance. The state owned National Spanish Security Forces (national, regional and local police, national guard) along with a couple of privately contracted security companies ensure passenger safety. The security screening filters are located between the general public areas and the departures area, between Check-in Areas 2 and 3. They consist of x-ray screening apparatus and metal detectors that flyers need to walk through. Passengers will need to be showing their boarding passes when going through airport security. Then each will be directed to a number of x-ray conveyor belts so as to start putting their put their hand luggage in to a tray. When going through security, passengers not allowed to have liquid containers more than 100ml in your hand luggage. Remove all liquids from hand luggage and put in to a clear plastic bag. The liquid items need to be visible in the tray. Remember all electrical items need to be placed in a separate tray. It is good to start removing belts, keys, money, mobile phones from your pockets before walking through security. Security Metal Detectors and Full Body Scanners used at Gran Canaria airport. Basically these are large metal detectors that you walk through. It is important that flyers do not have any metal objects on their person as these will trigger the x-ray scanner. 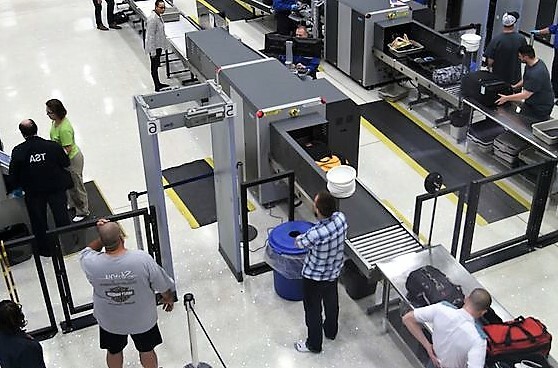 Occasionally passengers are asked to walk through a full body scanner. These are relatively new at airports and although these omit a very small amount of radiation, it does not pass through your body. These scanners designed to scan the clothing of the person only. Members of the security team may ask to perform a manual search. They usually use a hand scanner to scan the body or perform a physical security check. What if I have a pacemaker or other metal implant at airport security? Metal Detectors: The metal detectors do not interfere with pacemakers as long as your walk straight through. However if you delay in the scanner and decide to admire the view, then their is a possibility that it may interfere with your pacemaker. It is usually advisable to mention to the member of the security that you have a pacemaker. Full Body Scanners: These also are safe for people with pacemakers or other implants. After many years of testing they only give off the same radiation that equals what we would normally receive from electrical items in our home over a period of 10-15 minutes. Gran Canaria LPA airport has an excellent track record for security. The main airport authority – Aena prioritises airport security for all Spanish airports. You can down load a brochure on passenger rights at Aena. Also this page provides information on baggage allowances at the security gate.